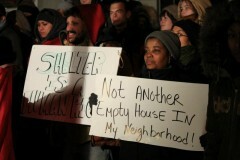 Occupy Minneapolis occupies home facing foreclosure so bank doesn’t kick family out | Fight Back! Minneapolis, MN - On Dec. 6, a national day of action for occupying foreclosed homes, more than 100 people rallied here in front of Bobby Hull’s house at 3712 Columbus Avenue. They announced the start of an occupation of his home to prevent US Bank from kicking Hull and his family out of their home. Bobby Hull, a working class Vietnam War veteran, has lived with his family in the South Minneapolis home since 1968. But now he’s in danger of losing the home, which would be taken by the bank. Although he’s lived there and made his mortgage payments for decades, due to health reasons he wasn’t able to keep up with the high payments more recently. Hull tried to negotiate a lower monthly payment with the bank, but they wouldn’t negotiate and moved forward with the attempt to take away his house. In South Minneapolis, where many working class Latino and African American families live, there are many families who have lost their homes due to foreclosure during the current economic crisis, which just further increases poverty and homelessness. There’s a growing movement of tenants and homeowners who are saying “Enough is enough!” to the banks and refusing to leave their homes when the bank tries to foreclose on them. The Occupy Minneapolis movement is supporting Bobby Hull to try to prevent US Bank from kicking him out of his house. Occupy Minneapolis is part of the Occupy Wall Street movement that is occupying public spaces and some homes too. These occupations are a protest in favor of the 99% of the population and against the 1% of the richest people, the banks and the large corporations that control the economy and politics of the country for their own interests instead of in the interest of the vast majority. Occupy Minneapolis’s central occupation continues downtown at The People’s Plaza outside of Hennepin County Government Center and City Hall, although Hennepin County officials continue trying to restrict the protesters’ ability to stay there. As of this writing the occupation of the downtown plaza continues. Occupy Minneapolis members are also continuing to occupy Monique White’s house in North Minneapolis. Like Bobby Hull’s house in South Minneapolis, Monique White is also in danger losing her home to foreclosure. The protesters say they’ll maintain the occupations until they win some justice.